Poompuhar is in the Sirkali Taluk of Nagapattinam district and it is also known as Kaveripoompattinam. The place has great historical importance. KalaikoodamAmong the dynamic dynasties that ruled over Tamil Nadu the Cholas held a place of esteem and used this ancient to cited on the temple inscriptions, in ancient literature and travelogues, different names and it has been referred to as Kaganthi, Sampapathi, Palarpukar Moothur, Mannagathu Vanpathi, Cholapattinam, Kaberia Emporium, and Kolapattinam. There are frequent references to this important port town in ancient Tamil literature. Books like the Akananooru, Purananooru, Pattinappalai, Pathirruppathu, Mutthollayiram, Silappathikaram, Manimekalai, Devaram, Thirutthondarpuranam and Nandhikkalampagamrefer to this town. Ancient Pali literature like Milindapan, Buuttha Jathakakathaikal Abithamma Avathar and Buddhavamsakatha and the travelogues of Periplus, and Merris Erithroy contain the references to Kaveripoompattinam. Ptolemy and Pliny also mention Poompuhar in their writings. Somaya a Buddha Pikkuni from Poompuhar donated one of the beautifully sculptured pillars that were erected by the Sunga-Kings of North-India during the second century B.C. The pillars carry the inscription Kaganthia Somaya Pikkunia Thanam which means “This Pillar was donated by Somaya Pikkuni of Poompuhar.” Buddhism flourished in Poompuhar two thousands years ago. With the rise of later Cholas in 850 A.D. the city regained its past glory. 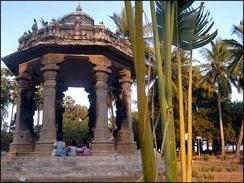 It is mentioned as Rajathiraja Valanaattu Nangoor Naattu Kaveripoompattinam in the Sayavanam temple inscription of Vikrama Cholan in the same temple. The town is called Puhar Nagaram. Later Kopperunchingan also contributed to the grandeur of the place. Details of Poompuhar have been read in the Brahmi inscriptions that date back to the second century B.C. in Barkuth of north India. The ancient Kings like Sembiyan, Musugundam, Manuneethi Cholan and Karikala Cholan who carried myths with them, added to the glory of Poompuhar town. Poompuhar grew into a great city during the reign of Karikala Cholan. He conquered territories up to the Himalayas and made a pass into China through the Himalayas. On his return Karikala Cholan brought back the monuments and gifts like the korrappanda, presented by the Vajra king, the Pattimandabam by the Magatha King and the Thoranavayil by the Avanthi King. These were rulers who were defeated by Karikala Cholan and these items were exhibited them at Poompuhar.